May 8, 2013 by Robert Franklin, Esq. For the second time in a year, a governor has vetoed an equal parenting bill. Last year it was Governor Mark Dayton of Minnesota who vetoed a bill that was 13 years in the making and that had finally gotten the approval of both houses of the state legislature. In so doing, Dayton behaved as if the bill were completely new and needed further study. In fact, he was just caving in to the demands of the family law bar. Now it's Governor Rick Scott's turn in Florida. The bill, that included both equal parenting and an overhaul of the state's antiquated alimony laws had received the overwhelming approval of the Senate, whose vote was 29-11 and the House that voted 85 - 31 in favor of the reforms. The bill passed last week and Scott could have vetoed it at any time, but he waited until literally the last day to do so. In Florida, when the legislature is in session, a governor has seven days in which to exercise his veto. If that time passes without his action, the measure becomes law. So Scott took the entire seven days and then vetoed the bill. Why? Well, following his Wednesday veto, the legislature was only in session two more days. The original vote tallies strongly indicated the possibility of an override of his veto. That only required a two-thirds majority to do, and more members than that had already voted in favor of the bill. So it looked like a vote to override was a sure thing. But with only two days left and other things on the legislative plate, the leadership announced on Thursday that nothing would be done on the alimony and parenting bill. Scott of course had been counting on that all along. Now, Scott wrote a letter purporting to explain his veto. Read about it here (Fox News, 5/2/13). But alimony "represents an important remedy for our judiciary to use in providing support to families as they adjust to changes in life circumstances," Scott wrote. "As a husband, father and grandfather, I understand the vital importance of family." Scott could not "support this legislation because it applies retroactively and thus tampers with the settled economic expectations of many Floridians who have experienced divorce," he wrote. "The retroactive adjustment of alimony could result in unfair, unanticipated results." 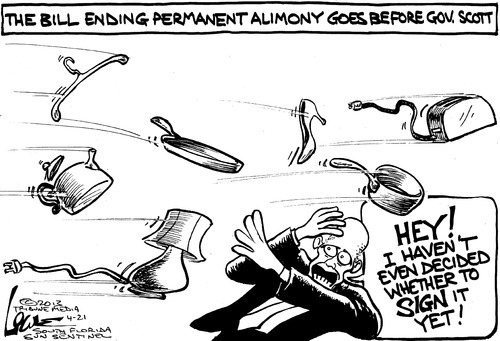 Florida law "already provides for the adjustment of alimony under the proper circumstances," Scott wrote. "The law also ensures that spouses who have sacrificed their careers to raise a family do not suffer financial catastrophe upon divorce, and that the lower-earning spouse and stay-at-home parent will not be financially punished. Floridians have relied on this system post-divorce and planned their lives accordingly." Essentially all of that is bunk. The bill didn't end alimony, it just put restrictions on it and required judges to be uniform in its application. As to its retroactive application, the very reason for the bill's existence and overwhelming passage is that alimony in Florida is, in many cases, utterly unjust to the payor. The bill sought to right those many ongoing wrongs. Scott's veto announces his belief that they should continue. What looks more like the reason for Scott's veto is captured in the cartoon above. I say that because in the week following the bill's passage, Scott was quoted as saying that he had been married for many years, thought family was a good thing, etc. At the time it looked like a veiled reference to his being badgered by his wife to veto the bill. It sounded very much like Obama's statement that, "when mama's happy, everybody's happy," with the clear implication that when she's not, no one is. Viewed in that way, the motivation behind Scott's veto looks a lot clearer. Women are the vast majority of alimony payees and he wasn't about to sign a bill that meant some of them might have to go out and get a job instead of relying on the earnings of a man with whom they couldn't be troubled to live. Scott claims to value families, but what greater inducement could anyone devise than offering money to a spouse to destroy hers/his? So Scott's domestic tranquility is the rest of the state's domestic hell. For at least another year, ex-husbands of every race, creed, color and class will continue to pay their exes' bills and keep up their standard of living. It'll all change when women are the ones who pay the majority of alimony. Then and only then will cowards like Scott see the light of right, fairness and justice and agree to reform alimony laws that are little but a throwback to days long past.